Whether you love it or cringe at the thought of cleaning it up, there’s no denying playdough and fine motor skills go hand in hand. Poking, squishing, and rolling “snakes” are important work for little finger muscles on the road to learning to write. The irresistible dough gives little hands lots of practice in mobility and grasping before they even pick up their first pencil. In a way, playing with playdough can directly impact your child’s writing skills. As adults, I think we often limit the possibilities for playdough play to cookie cutters and “snakes”. 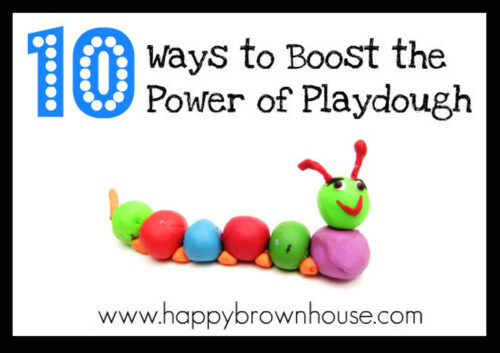 While these are fun and needed skills, there are a ton of ways to give your playdough time an extra fine motor boost by adding a few simple household items to the table. 1. I love to add plastic knives, pizza cutters, and child-safe scissors to the table when playing with playdough. It is easier for little hands to manipulate these tools with the soft material and gives them a chance to practice using these tools safely. 2. Hide marbles or beads in the playdough. Let your child pinch and pull the dough with tweezers until they find them. 3. Use a pencil to practice making writing marks in the playdough. 4. Use playdough mats to target certain learning skills. 5. Have your child roll the playdough into small balls. Then, use toothpicks to build structures. The playdough balls can serve as the corner joints. 6. 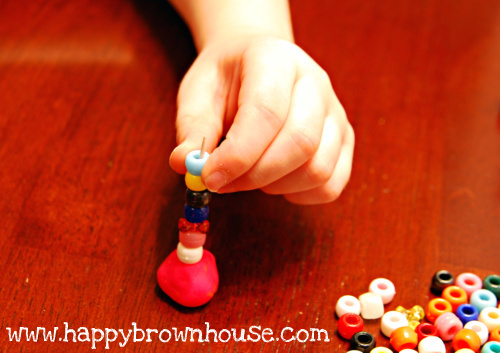 Place a toothpick in a ball of playdough and have your child thread beads or cheerios onto the toothpick. This is also great to practice counting number sets! 7. Add straws to the playdough. 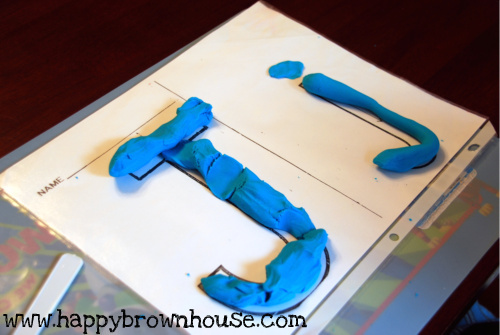 Draw a letter, number, or shape for the children to push the straws in along the lines like this Playdough Prewriting Activity from Kids Activities Blog. 8. Use a plastic hammer to pound golf tees into the playdough (similar to our Pound the Sound activity). Make sure to place a cookie sheet under this activity to save your table. 🙂 After the golf tees are pounded in, have your little one balance marbles on the end for an extra fine motor punch. 9. 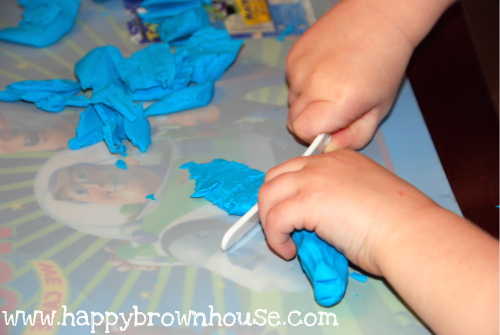 Use stamps (minus the ink) to make impressions in the playdough. 10. Use common household items like a hole punch, garlic press, cookie scoop, etc. If you don’t want to use the ones in your kitchen drawer, you can find these at the Dollar Store. Place them in a plastic tub and store for next time. 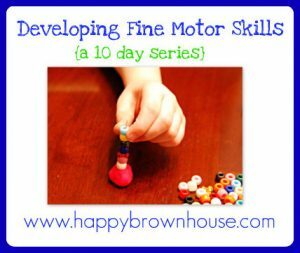 This post is a part of the 10 day series, Developing Fine Motor Skills. 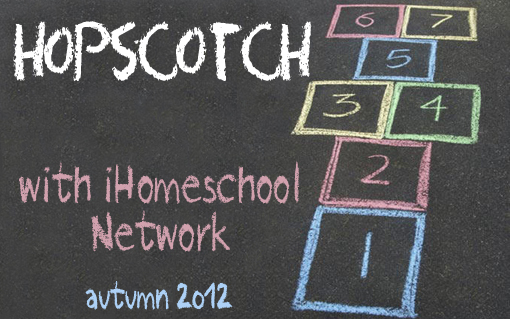 This series is part of the iHomeschool Network Hopscotch. To see the list of the topics from the other bloggers, visit iHomeschool Network. There are some fantastic topics and giveaways! Don’t want to miss a post in the series? Subscribe by email or RSS. Follow us on Facebook or Twitter. My kids LOVE to stick things in play dough. I also have some paper soldiers that I printed off that they can ONLY use in play dough because it helps them stand up. Love your ideas, Sara! I seem to do the same old thing with playdough. Going to try these out this week. Thanks, Shonda! It’s so easy to get in a rut, isn’t it? I know I do at times, too. 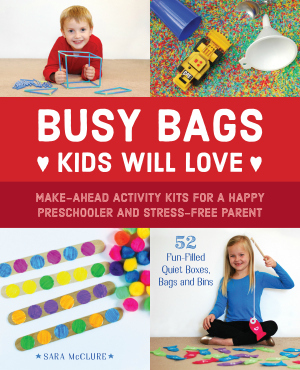 Hope your little ones like them! Muchas gracias por tus consejos !